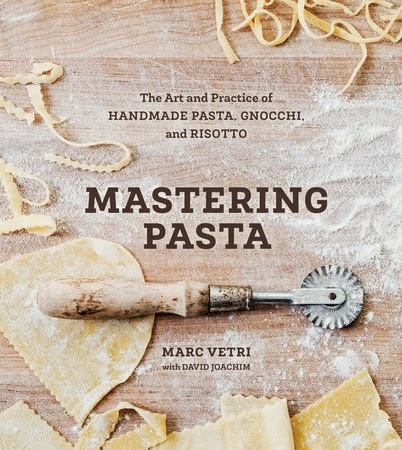 Mastering Pasta: The Art and Practice of Handmade Pasta, Gnocchi, and Risotto by Marc Vetri is for the serious cook who wishes to master the art of scratch-made pasta dishes. It is a compendium of all things pasta, from the flour to the dough to the meal. Highly recommended by chefs like Jamie Oliver and Mario Batali, Mastering Pasta teaches the techniques for pasta making and shows you how to make more than 30 types of dough. In addition, he includes recipes for sauces, baked pasta dishes, and more. While I don't consider myself to be anywhere near an expert cook, there are many things about this cookbook that I like. At first glance, I was intimidated by Mastering Pasta, because I didn't know if I could understand how to even begin. However, I find it to be a wonderful, inspiring primer that has already taught me a lot and given me confidence to try some of the techniques. Vetri explains things in an engaging way that makes this book just as enjoyable to read as it is to cook from. He gets into the basics of wheat and flour, detailing the actual anatomy of wheat so you understand how to begin by choosing the proper flour for different types of pasta dough. He also explains things like the correct pasta-to-filling ratio and how to properly cook fillings so they turn out right. This gorgeous collection of recipes is lavishly photographed, and I feel immersed in Italian culture as I read through it. The photographs help clarify the techniques and give cooks an idea of the finished dishes.
" ...the difference between a recipe and a gorgeous plate of food is you. Think of it this way: cooking from a recipe is sort of like driving from a GPS. Follow the directions and you get to your destination. But you still have to drive the car. You still have to cook the dish. And cooking means responding to your environment, tasting the ingredients to see how much seasoning the need, observing the texture of pasta dough to see if it needs more flour or water, and feeling the thickness of the noodles to decide whether it's right for the dish you are making" (p. 6). This section alone inspired me not to be afraid to experiment and have fun with the experience of cooking. Though I might not try to tackle Pappardelle with Rabbit Ragu and Peaches, there are many recipes in Mastering Pasta that will become staples in my house. The publisher provided a review copy of Mastering Pasta.